The trophy is called the American Ambassador’s Cup. 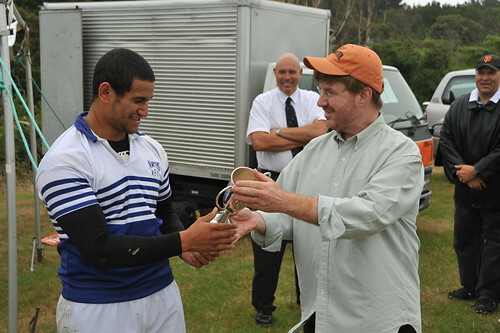 It was first presented by Ambassador John F. Henning in 1967 and has been played every year since, in a 7-a-side tournament between Wellington’s rugby clubs. It is Wellington’s premium Club Rugby Sevens tournament. The finalists were Northern United and Oriental-Rongotai. Oriental-Rongotai were the defending champs, but Northern United won the 2010 tournament 28-19. Photo Above: Ambassador Huebner passing the Ambassador's Cup on to the Northern United captain, Tomasi Palu.